Posted August 4, 2009 by Norburn Lighting and Bath Centre & filed under Energy Saving, Featured Projects, Green Living, LED . Residential, retail, commercialâ€¦ itâ€™s the right light. 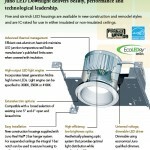 No matter what the environment the Juno LED Downlight is the new, improved approach to recessed lighting. 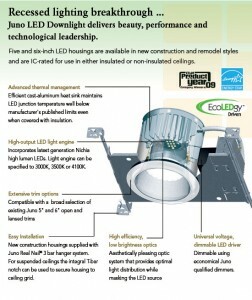 Extremely low energy consumption, remarkably long life, minimal heat generation, and uniform illumination make it the right answer for so many applications.Three color temperatures; 3000K,3500K and 4100K, are available in five and six-inch housings in new construction and remodel styles. All housings are IC-rated for use in either insulated or non-insulated ceiling.